The C55A Clincher with alloy braking surface is a great all-round wheel that can take whatever punishment you can throw at it. 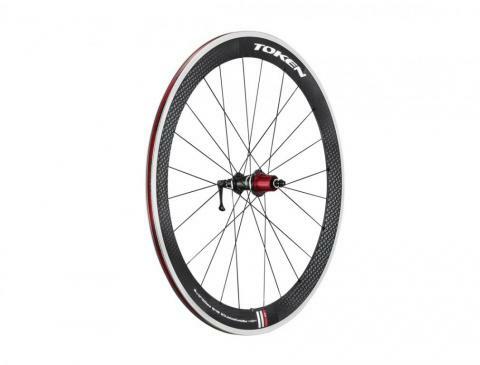 With a 55mm aero profile rim, these wheels give you a distinct advantage on the flats. Under power you’ll discover efficient power transfer, and when sprinting, the wheels stay firm underneath you. The 55mm rim profile is easy to control even in side winds thanks to its aero design. With 20 spokes up front and 24 in the rear, this slightly higher spoke count means lower spoke tension resulting in a more comfortable ride. With a lighter coloured decal compared to the classic black carbon rim, the wheels will stand out in the crowd and are sure to attract the attention of onlookers. Our Shark Tail skewers, currently on display at the reddot design museum in Germany, complete the wheelset. Weighing in at 1,573g per set, these wheels are very competitive in the weight stakes. In addition, unlike other wheel manufacturers, we don’t feel it’s neccessary to charge a ridiculous premium for the privilege of owning a set. Used by Alaska Tri Aspire team.